A brand-new design, the best processor around, and strange vibrations. 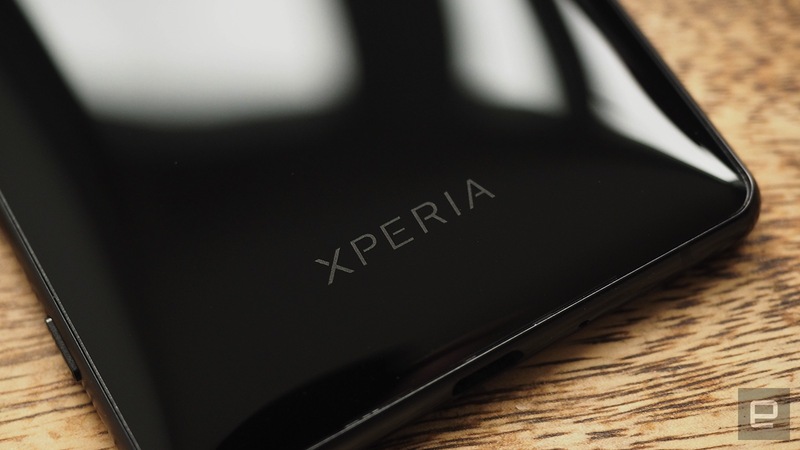 Sony isn't the big hitter in mobile it once was. It hasn't been one of the popular kids for a while now, but that hasn't stopped the company from producing new smartphones at a steady clip. 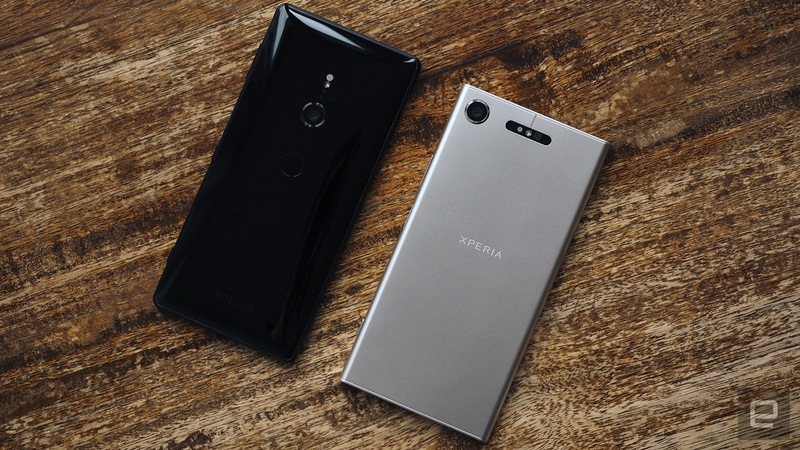 At Mobile World Congress in February, Sony announced its first new hopes for 2018, the frontman of which is the Xperia XZ2. The flagship marks something of a fresh start for Sony: a departure from the recycled design language that's touched every Xperia for several years. What you get is a device that's curvier, glossier and an absolute dream to use in several respects. The problem Sony still faces, though, is a lack of unique features to entice people away from the brands and lineages they've become familiar and comfortable with. Sony’s Xperia XZ2 has an elegant all-glass design and delivers outstanding performance. 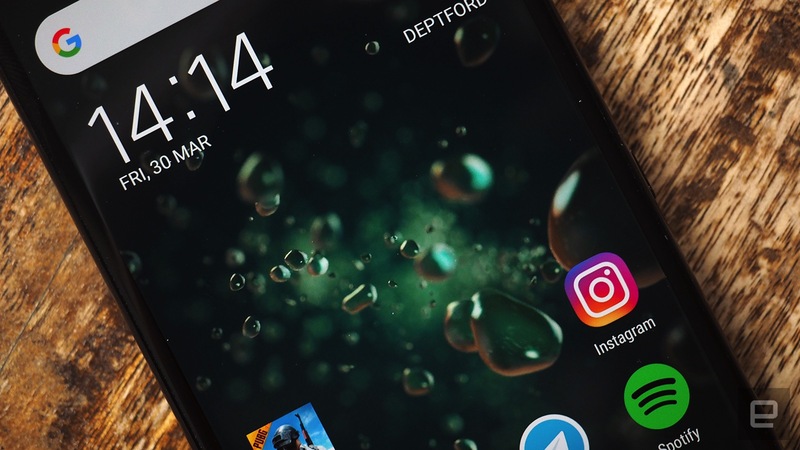 None of its unique features are very exciting, however, and with the Galaxy S9 being an attractive alternative, it’s not a must-buy. 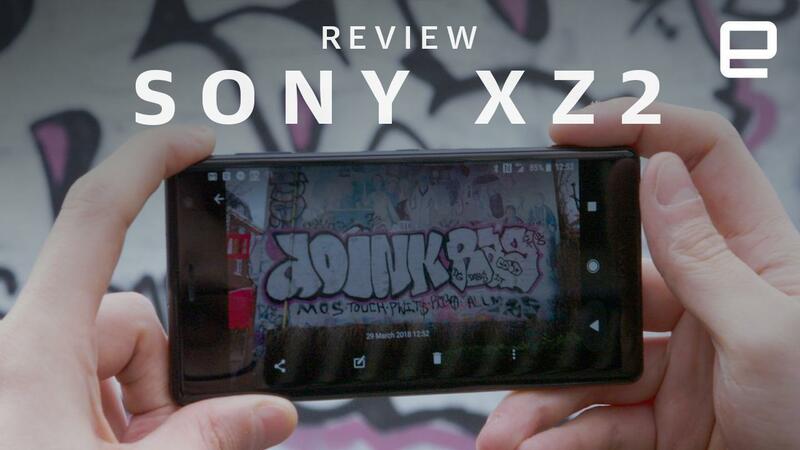 Be the first to review the Xperia XZ2? Ever since the Xperia Z hit the scene way back in 2013, Sony has remained committed to a fixed aesthetic that it calls "OmniBalance." I'm personally a fan of this blocky, almost utilitarian design brief, which has stayed recognizable and unique in comparison with the many different looks other manufacturers have played with over the years. But, as the saying goes, if your mobile business is going broke, time to fix ... something. And so OmniBalance as a design concept has been retired, but nevertheless the XZ2 carries some classic Sony traits. The defined border that spans the edge of the device is still very OmniBalance-esque, and thankfully Sony has decided to keep the dedicated, two-stage camera button -- a rarity among smartphones these days. Naturally, there isn't a great deal to say about the front of the device, other than that it sports a small multicolor notification LED, which I always find handy. The back is where you'll see the greatest difference from Sony devices past. Instead of just a flat pane, as per OmniBalance rules, you now get a subtle, shallow curve that changes the feel completely. There are no hard edges here, and, as the XZ2 is covered almost entirely in Gorilla Glass 5, it's seductively glossy. Be careful where you put it down, though. Leave it on the arm of a sofa or basically anything that isn't a completely level surface and you can bet it'll slide around as if it has a strong desire to see what hitting the floor is like. The sleek glass body isn't the only thing that screams premium. It's dense -- not heavy, but dense, like it could take a left hook to the face and not even flinch. It's waterproof too (IP65/68 rated), which you'd expect, since Sony was an early proponent of that feature. And while I'm quite happy with the deep black of my review unit, you can pick up the XZ2 in a silver or turquoisy shade if that's more your vibe, or a pastel pink in some markets. It's a good-looking phone by all accounts, but that doesn't mean there aren't shortcomings. For one, it's a little on the big side. It has to be to accommodate the large display, but even with my long digits, it's not the easiest phone to manage one-handed. In other words, it won't be to everyone's preference. Similarly, you've only got a USB-C port to work with, which is another way of saying there's no 3.5mm headphone jack. Granted, that's pretty much standard procedure now, and Sony's kind enough to include compatible headphones and a USB-to-3.5mm dongle in the box. Still, it's worth mentioning, since I know lack of jack is a deal-breaker for some. What personally rubs me the wrong way, though, is the clutter around the back. 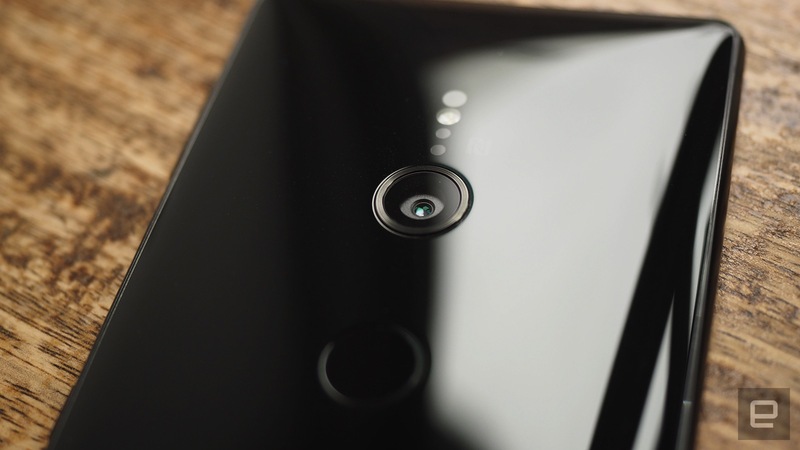 Previous Sony phones (outside the US, anyway) have featured a power button/fingerprint reader combo, but the XZ2 goes with the tried and tested back-mounted affair. First off, I don't like how the camera and fingerprint reader are all cramped up together. It's not particularly pleasing to the eye (probably a golden-rule-type thing), and it's not very functional either. Yes, the primary camera is in such a position that your hand never obscures the lens while you're shooting, but it pushes the fingerprint reader too low. The whole point of a back-mounted sensor is that your fingertip naturally falls on it. Instead, I catch myself pawing at the camera glass as the reader rejects random finger flesh. Overall, the XZ2 looks and feels very 2016 flagship. If that sounds like a criticism, it's not. However, the marketeer in me can't think of anything to plug in the way of distinguishing features. There's absolutely nothing wrong with that, but Samsung has its curved screen, Apple has its notch, and Sony? Well, Sony has something that doesn't look the same as everything else it's made in the past five years. 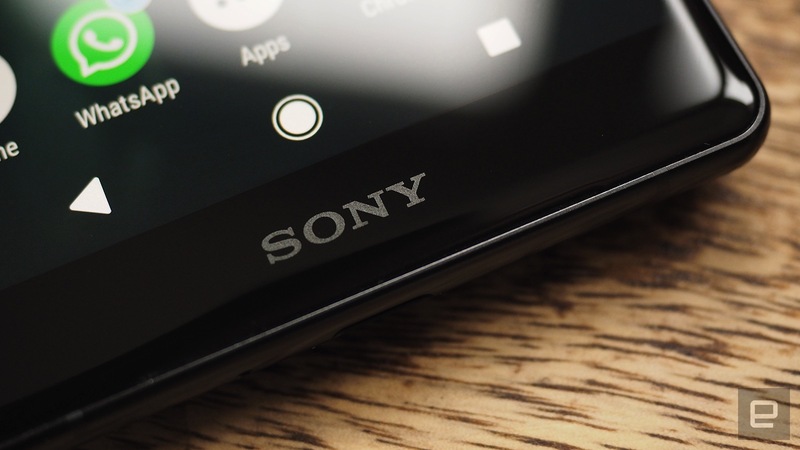 If there's one thing Sony knows, it's smartphone cameras -- you'll find its sensors in most top-tier devices. 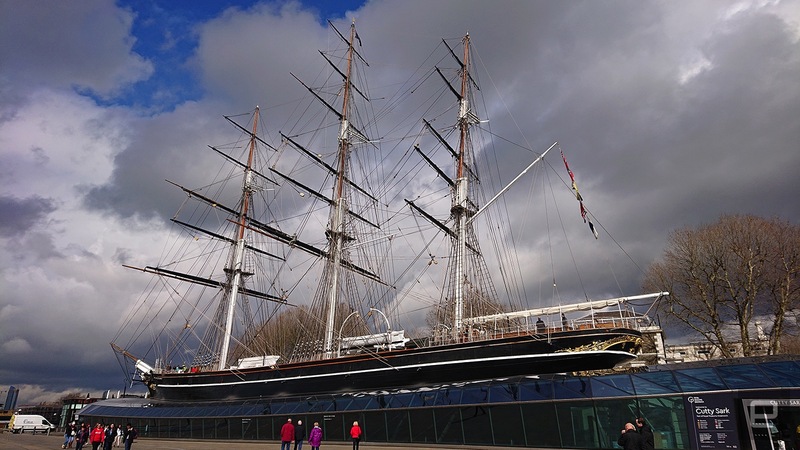 The XZ2 brandishes one of the company's 19-megapixel "Motion Eye" cameras, and, boy, does it take some beautiful shots. There's bags of detail in the 17-megapixel images it spits out, with color saturation on point the vast majority of the time. It holds up well enough in low light, although, as is typically the case, the shutter speed gets much slower in these less-than-ideal conditions, making slightly blurry shots unavoidable at times. One of the best things about the camera is ease of use. The two-step shutter key feels much more natural than tapping at an icon on the screen, and a long press of that launches the camera app immediately for those opportunistic shots. Also, Sony's "Superior Auto" mode takes the hassle out of fiddling with settings and scene selection, and it pretty much always squeezes the best out the camera. Very occasionally, pictures came out slightly underexposed, but that seems like a fair trade-off when you get mostly great results from simply pointing and shooting. The XZ2's camera is kind of simple compared with other phones on the market. There's no dual camera arrangement, optical zoom or variable aperture to swoon over. There is a bokeh app that sort of does the same thing a dual camera would, but it's not particularly user-friendly. You have to select the subject in the viewfinder and hold the phone steady while it takes two separate pictures at different focal lengths. And the result looks far more manufactured than I've seen from proper dual camera setups. However, the fact that the XZ2's single camera has an f/2.0 aperture means you get some nice, natural background blur in close-up shots. Despite lacking anything fancy on the imaging hardware side, the XZ2 can do a few things no other phone can. First, it can shoot 960fps video at full HD resolution. When Sony introduced the super-slow-mo feature on the XZ Premium last year, 720p was as good as it got. Samsung's Galaxy S9 and Huawei's P20 top out at 720p too. However, being able to now shoot in 1080p isn't a big deal. In fact, it makes the feature borderline unusable. That's because, whereas at 720p you can record 0.2 seconds of slow-mo at a time, at 1080p that window shortens to 0.1 seconds. The feature is incredibly testing at the best of times. You can't reactively hit that slow-mo button or you'll have already missed what you were trying to capture. You have to predict it, which is far more difficult when we're talking such small fractions of a second. While I was out testing the camera, I managed to stop a passing skater who agreed to do a few tricks for me to capture in super-slow-mo. After trying to time a 1080p clip with zero success, I switched to 720p just to get the thing shot and let the guy leave. Even then, it took me about six tries to get something usable. The same gripe cropped up in my colleague Cherlynn's review of the S9, too. Super-slow-mo is cool and all, but it's so hit-and-miss as it is that the 1080p upgrade is something you can ignore entirely. The XZ2 is also the only phone that can shoot 4K HDR video, beating Samsung to the punch. There are a couple of reasons why this feature can be similarly overlooked. For starters, the 4K HDR clips look ... bad. Rather than adding an extra layer of contrast, HDR seems to be code for "Let's overexpose everything." Given the high quality of regular 4K clips shot on the XZ2 (tinny audio notwithstanding), I see no reason to switch HDR on. 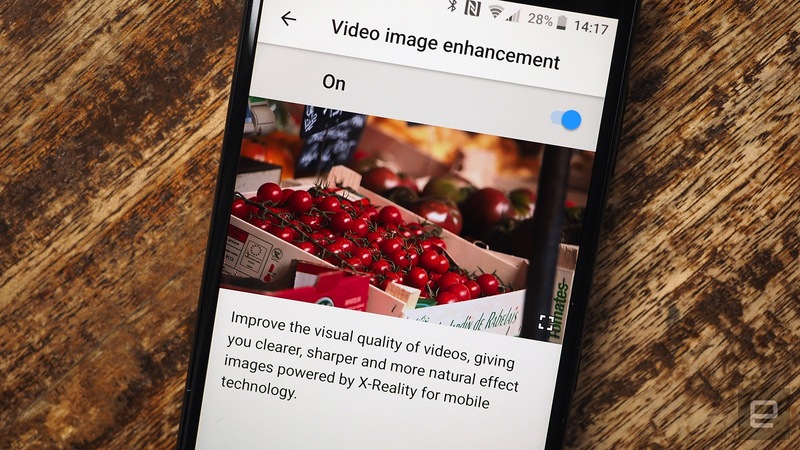 Also, unless you have compatible hardware, like a new TV or an expensive monitor, you're only going to watch these videos on the screen you have in your hand. I tried to watch the 4K HDR clips on my MacBook but gave up after trying three different players with no success. Sony has a habit of throwing camera features at the wall and hoping something sticks. 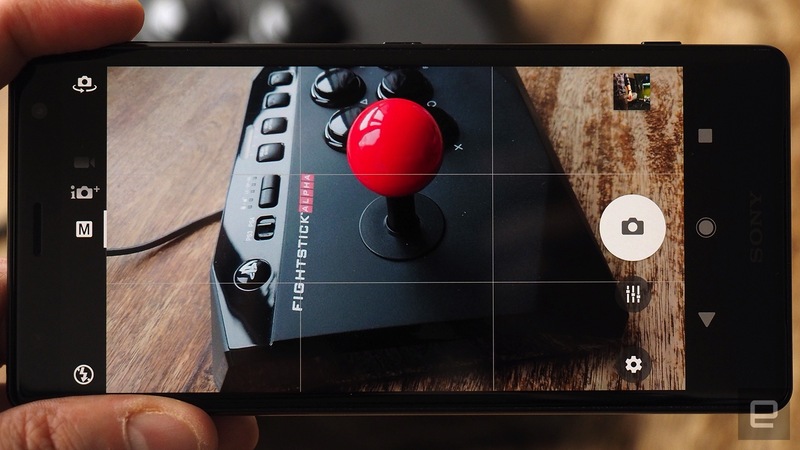 It may have failed here, but forget about those exclusive XZ2 shooting modes and you've still got a great smartphone camera to work with. The front-facing shooter might leave selfie addicts wanting, though, because there's only so much detail you can capture with a 5-megapixel sensor. The only counterpoint to that is you can now use the front-facing camera with Sony's 3D Creator app, meaning you can sort of make a 3D scan of your mug without getting a friend to help. It's a bit of a clumsy process, and the models you end up with tend to be a bit warped and strange. Still, it's there if you want it, which you probably won't. 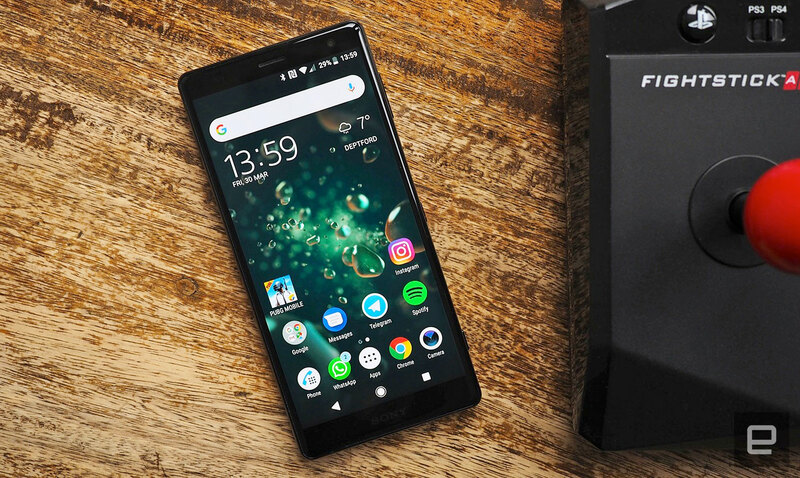 When Sony exec Hideyuki Furumi introduced the XZ2 and XZ2 Compact onstage at Mobile World Congress, he referred to them not as smartphones, but "entertainment devices." It's marketing-speak, obviously, but there are some design choices backing this classification up. 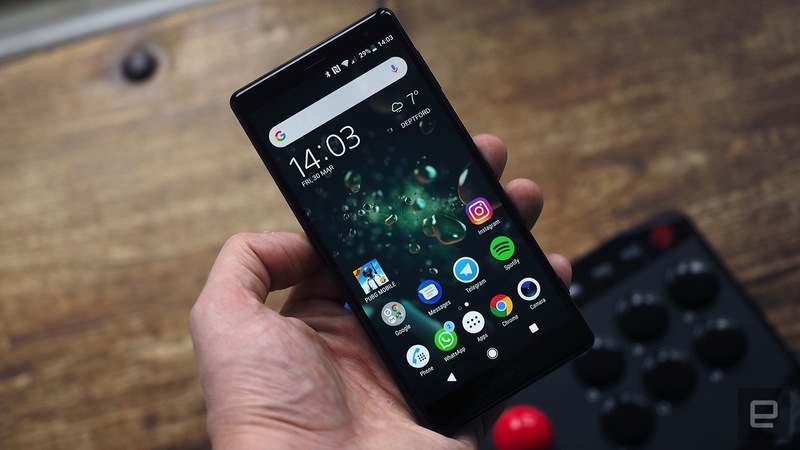 Most notably, the XZ2's big 5.7-inch HDR display. It's an LCD panel, so blacks aren't OLED deep, but otherwise it's very pretty indeed, with rich, vibrant colors. It's paired with Sony's X-Reality engine, which "upscales" everything onscreen from normal dynamic range to HDR (if it isn't HDR already). Switching the enhancement mode on and off, you can see the extra contrast and depth it adds to, say, the latest Deadpool 2 trailer on YouTube. It definitely works, but it is quite subtle, so it's not something I expect people will be lining up to get their hands on. The display doesn't hold up that well in direct sunlight. It seems the panel just doesn't have enough power available to it to completely eliminate glare on a bright day, but power is a precious commodity on the XZ2. The display absolutely hammers the battery, being responsible for around 70 percent of drain per charge, in my experience. The phone actually has a pretty big battery hidden beneath its glossy exterior, and I dare say that if it sat on a desk all day, you'd get perhaps a day and a half of mild use out of it. Maybe more. But obviously I've been playing around with it a lot, taking pictures, playing games and everything else you do to get really familiar with a new smartphone. Every time the screen is on with the brightness cranked up, you can see the charge percentage ticking down like a clock (I'm exaggerating, but you get the idea). And, no, I haven't just been playing 3D games for hours and then gone searching for something else to blame the battery life on. Just having the viewfinder open to shoot the sample photos necessary for this review gulped down the best part of a charge. Naturally, there are modes that extend battery life, but if you're a power user, be prepared to charge the XZ2 regularly. The phone supports wireless charging, but I'd recommend plugging the thing into a wall to take advantage of fast charging. At low percentages, I was able to get a good 30 percent boost in only 20 minutes, so there's that at least. Anyway, back to the entertainment. Hi-res audio support is a given -- Sony's been making a point of this for years now -- but not so common are the stereo speakers the XZ2 has up front. They're ... not good. They get real loud, but the highs are raspy, and the bass tones empty. It's fine for a YouTube clip or whatever, and only bus menaces play music out of their phones anyway. Undeniably the XZ2's strangest feature is "Dynamic Vibration." What Sony's done, basically, is install an oversize haptic actuator, which is the vibrating component of the phone. Pair that with some software that turns audio in rumbles and you've got Dynamic Vibration. It doesn't work very consistently, though. 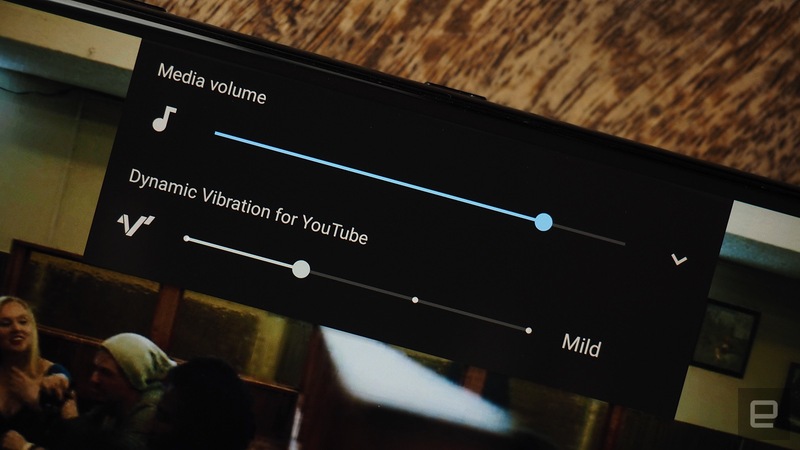 Not all apps feed audio into Android in the same way, so only those that pass through the media volume channel can be remixed into vibrations. It doesn't work in Twitch unless there's some loud gunfire onscreen. Most games I've been trying are incompatible, too. 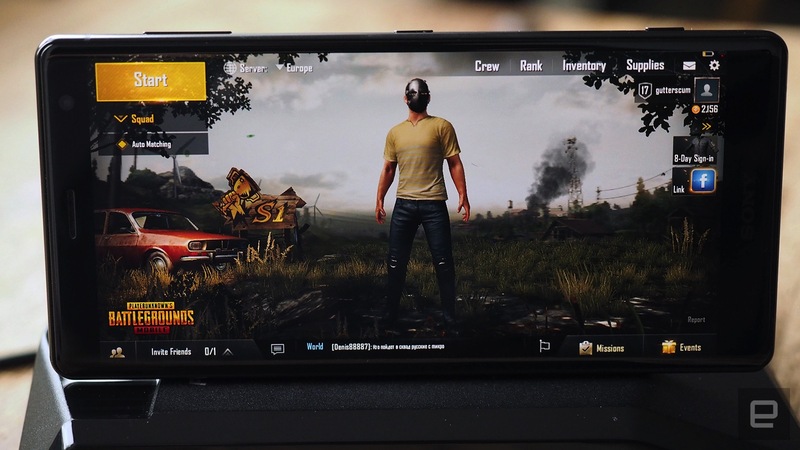 I'd love it if the thing would rumble when I'm getting shot in the back in PUBG Mobile, but it doesn't. If for some reason you want numb hands in five minutes, you can turn the vibration setting to max and put on a bass-heavy track on YouTube. It's pretty damn gimmicky, though, especially when it's a coin flip as to whether an app uses the right type of audio. This is where it gets interesting. Under the XZ2's hood is a Qualcomm Snapdragon 845, the best chip money can buy right now. It's the first phone I've played with in a while that completely encapsulates that new-computer feel -- when you turn a laptop on for the first time and everything is effortless and lightning fast. That's what using the XZ2 is like. Everything happens instantly and it all moves smooth as butter. Every game plays flawlessly at the highest possible settings. It never gets too hot. No gremlins, no crashes, no weirdness. As close to perfection as I've seen. That's all you need to know, really. And bear in mind that my review unit has only 4GB of RAM, not the 6GB some Asia-only XZ2 phones get. Sometimes the skins that manufacturers layer on top of Android can slow things down a little, but that's not an issue here. Sony's augments to Android 8.0 Oreo are few, and mostly geared toward visual personalization, but there are a few duplicate apps, like Sony's own email client, gallery and video-specific gallery that needn't exist. I don't have much love for the pre-installed Xperia Lounge, AVG Protection, Kobo or Amazon apps either. Xperia Assist is quite handy, though, popping up whenever I was trying out new features like Dynamic Vibration to explain it to me by way of chatbot. Sony's additions are inoffensive on the whole. Unfortunately, Sony has yet to provide me with concrete US pricing and availability details. What I do know is that the XZ2 goes on sale in the UK on April 6th for £699. Considering that it's not yet up for pre-order in the US, we can assume a slightly later launch -- late April/early May, perhaps -- and hazard a guess at roughly a $750 to $800 price tag. That assumption's based on both the UK price and the fact that Sony phones are typically on the expensive side no matter what kind of price band they fall into. Obviously, there are a plethora of phones you can buy with this kind of money, but trust me when I say you want to put your dough toward a 2018 device with a Snapdragon 845 inside. The general user experience is too good to pass up. 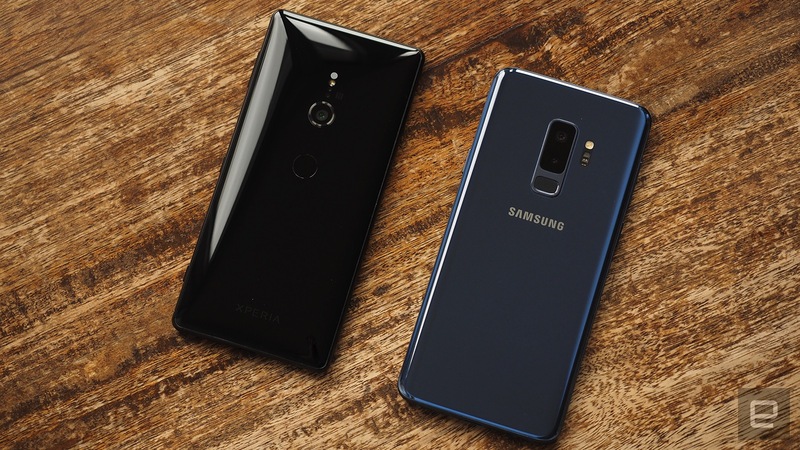 Now, the 845 party is going to get a lot more crowded as the year rolls on -- the LG G7, ASUS Zenphone 5Z and HTC U12 have been invited, to name a few -- but right now the Samsung Galaxy S9 is the nemesis of the Xperia XZ2. And that's where Sony might have a problem. While I prefer the glossy look of the XZ2, the Galaxy S9 and S9 Plus both carry better, higher-resolution displays than their Sony rival. They also have larger, 8-megapixel front-facing cameras for selfies and socials, and the S9 Plus comes with 6GB of RAM as standard, whereas the 6GB XZ2 is reserved for select Asian markets. What's more, features that are relatively unique to the S9 duo, such as variable aperture cameras and AR emoji, are things that resonate more with consumers than 4K HDR video recording. The feature sets of all three phones are otherwise very similar, but when the S9 is $720, the S9 Plus is $840 and the XZ2 is probably somewhere in between, you really have to be sold on the design of the XZ2 to ignore the obvious shortcomings on the spec sheet. There's always the Xperia XZ2 Compact, of course, which is almost exactly the same phone in a smaller, 5-inch package. You'll save yourself a good chunk of change downsizing, too. US pricing hasn't been confirmed, but in the UK the Compact will retail for £549 -- significantly cheaper than the £699 asking price of the XZ2. The features that really differentiate the XZ2 from its competition are easily overlooked, though: Dynamic Vibration, super-slow-mo at 1080p and 4K HDR video. These aren't things you are going to use very often, if at all. Assuming a price of roughly $750 to $800 is accurate, the XZ2 is in danger of being overshadowed by the Galaxy S9 and S9 Plus. I personally prefer the look of the XZ2, and you might too. But would you be happy spending the best part of a grand on one when you know there's something that little bit better out there for the same kind of money?